Samford University recently hosted a “Women in Sport” panel discussion featuring five successful women working in the field. Cosponsors were the sport administration program in the Department of Kinesiology, the sports media minor in the Department of Journalism and Mass Communication, and the sports marketing concentration in the Brock School of Business. During the event each panelist spoke about their faith as an important element in both their personal and professional lives. After the speakers shared their stories, the floor opened for questions from students interested in working in the world of sport. 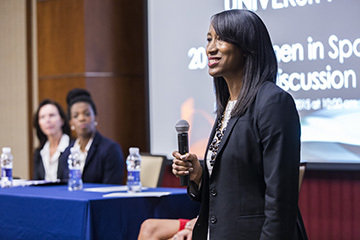 Alongside Daniels, the panel included Samford University’s Director of Football Academic Services Christina Harris; Director of Marketing and Culture at Knight Eady Sports Group Suzanne Alvarez; and Senior Vice President of Store Operations at Hibbett Sports Cathy Pryor. Samford also welcomed back 2012 alumna Claire Waggener who currently serves as the associate director for the National Commodore Club at Vanderbilt University. Additional reporting by Allison Kanne, a senior journalism and mass communication major.